Sunday Salon 9.12.10 – my books. my life. I was feeling a little lazy this morning and almost decided against a Sunday Salon post, but then I realized that I may not have a chance to write one the next two Sundays so I better post one today. As I started writing, this post became much more about my life in general than about books. But you’ll still find a condensed reading/blogging update at the bottom. Next weekend, my best friend from law school, Susan, is coming for a last minute visit. I haven’t seen her in over a year and she’s never seen where I live now (I actually think she’s never been to Florida). We’re going to squeeze a quick Wizarding World of Harry Potter trip in (which I promise I will actually post about this time) followed by a stop at Downtown Disney to soak up some Disney atmosphere. Then we’ll head back over here and spend the second day at the beach. I don’t think I can adequately explain how excited I am for these two days. I would give just about anything to be able to see Susan every day again. At least we have our daily emails. A few days after Susan leaves, I’m heading up to Michigan for a long weekend for my little cousin’s wedding. I’ve got just about my entire time there planned with family and friends and I am hoping (fingers crossed people) that I get a little fall weather. I haven’t seen fall in three years and I would love to experience just a touch of that fall feeling (the crisp air, that fall smell, you know what I’m talking about). Fall was always my favorite time of the year and I really miss it living here (but ask me which place I prefer come January). As for books, I didn’t manage to read much this week. I had a lot going on in the evenings and I spent my Saturday attending a conference and then watching Michigan’s incredible win over Notre Dame (but I am going to wait a few more weeks before joining in with those Heisman whispers surrounding Robinson). I have a feeling my reading is going to wane a little the rest of this month but sometimes you need to focus on the real world a little and that should be fun. This week I reviewed Ape House and Mr. Peanut. I also found a nice discussion on my Reading Speed & Speed Reading post. Then I kind of disappeared. Since I didn’t do much reading, I’m going to skip my usual Just Finished/Currently Reading section. I’m still listening to Harry Potter and the Order of the Phoenix on audio. 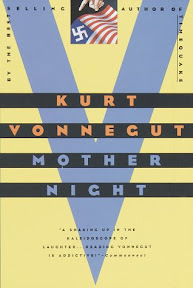 My print book is Mother Night by Kurt Vonnegut. I hope everyone had a wonderful week and is enjoying their Sunday. Anyone reading anything fabulous? If you end up in Florida for some reason, I’ll meet you there. But it really isn’t worth a trip on it’s own. I only say that because it’s so small. Just a corner of the amusement park. It’s still pretty awesome. I’m halfway through an Enid Blyton book that I like a lot and I just started Night Train to Lisbon. Sounds like you have some busy time coming up. Enjoy your visits! Am reading The Help by Kathryn Stockett for my book club and loving it. I hope you enjoy all your planned activities! I would love to see the Wizarding World, but since I’m not even in the US I doubt it will happen.. Sounds like you’ll be busy! I love fall, and I like to pretend we have it here (in California), but it really only lasts for about a minute…. Sometimes our weather in the UK is awful but we do get the symptoms of the season, I didn’t know parts of the US were like that. Enjoy your weekend with your friend! Sounds like you have an exciting weekend coming up! Looking forward to your post. I’ve had a good reading week but a bad blogging week due to my neck/shoulders/back flaring up after a physio appointment. I haven’t been getting on the computer at all outside of work in the hope that it might help to settle it down, so I’m behind on some posts I want to write. But I finished The Hunger Games which I enjoyed but I did feel a bit iffy about a few plot points, The Vanishing of Katharina Linden by Helen Grant which I absolutely loved and will post about as soon as I’m able and I started The Blue Castle by L.M Montgomery which is fabulous so far. Hooray for BFFs coming to visit. Mine lives in London and we haven’t seen each other in person in years. 😦 We do have the occasional video chat though which helps! Have a great time! Have a great time the next few weekends. It’s always great to get together with old friends. Shame you two don’t live closer. Fingers crossed for beautiful wedding weather. I am always reading way too many books at one time. I just finished I’d Know You Anywhere… pretty good read. I am reading The Last Town on Earth right now and it’s not the dystopian story I thought it was.